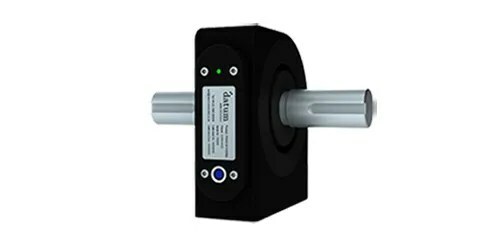 The Datum Electronics Series RS425 contactless torque transducer has been designed to fit easily in line with any drive-train or test rig, using either a spline or key-way shaft. This type of torque sensor has many advantages over other torque measurement systems, including zero bearing friction, high speed and high torque applications. The Series 425 Contactless Torque Transducers can be adapted to replace existing drive shafts on test rigs and in drive lines, this saves the time and cost of designing in special couplings and intermediate shafts to accommodate conventional transducers. We are able to modify the ends of the transducer to best suit your requirements, and can even design bespoke ends to fit. By measuring torque on longer drive shaft you prove the accuracy of the measurement and its tolerance to offset loads. Using a direct replacement with a lightweight rotor the dynamics of the driveline are maintained. The RS425 rotary bearingless torque transducer utilises a strain gauged shaft for accurate and reliable torque measurement and a set of rotating on shaft conditioning electronics, the digital signals are transmitted to the non-rotating part of the system or stator providing a reliable and highly accurate torque measurement solution. The rotor is continuously powered enabling static torque measurement to be made. Not only does the RS425 Series offer great technical advantages but the range of torque sensors are competitively priced. *In many cases higher RPM ratings can be attained – please call our engineering team to discuss your applications. The RS425 series contactless torque transducer is not limited by bearings; therefore it can be used at higher speeds and places with no bearing loads on to the shaft. The stator needs to be mounted in relation to the shaft within an operating envelope of +/- 3 to 5mm. The standard range can measure torque ranges from 0Nm up to 10kNm, the same modular elements have been applied to bespoke torque transducers for use down as low as 1Nm and up to 500kNm. Using our new generation of electronics as found in our industry standard M425 Torque transducer, the RS425 gives customers the ability to choose the sample rate that they need from 1 up to 4000sps, with higher resolution using up to 24bit technology. The Series RS425 contactless torque transducer transmits calibrated digital data as this is a cleaner and more defined method of transmitting data. The on-shaft signal from the strain gauge is converted to a digital signal and amplified on a shaft. It is this signal that is taken off the shaft and processed by either with our DUI; Datum Universal Interface, or with our free of charge GUI software, providing the end user with clean and definitive data transmission. The Series RS425 contactless torque transducer is compatible with our new Datum Universal Interface (DUI) which gives a range of digital and analogue outputs as well as a digital display of the torque, speed and power. It can also be set in a legacy mode to work with our older range of indicators and displays. If an analogue signal is required, our Series 425 bearingless torque transducers are able to provide either 4-20mA or 0-10VDC output with our DUI; by converting the digital data signal from the torque transducer to an analogue signal. However, the effect of external or electrical noise can impact upon signal strength and definition in this instance. Other commercial applications may use slip rings or analogue signals to transmit data, but the Datum Electronics series 425 outputs digital as standard. A popular option is to view data from the transducer on a PC or laptop for torque data analysis. Our DUI software has been developed to allow the user to view the torque data in real time with optional data analysis for performance monitoring and control. Using a simple USB interface, or Ethernet connection the transducer data can be displayed and logged at the touch of a button with our DUI. If your requirements dictate anything above our standard torque sensor range of 10,000Nm, we can and have engineered torque measurement transducers up to 500,000Nm. *Higher speed requirements are available, please contact our team to find out more. *For more information please refer to the M425 Rotary Torque Sensor Datasheet and Handbook in the Technical Documentation section.